HomeFashionIsha Ambani is the quintessential Sabyasachi bride! The diva looked stunning in her custom hand-painted and hand-embroidered lehenga. The Ambani family is gearing up for the grand celebration of Isha Ambani's wedding to Anand Piramal on December 12. And the wedding festivities have already begun in full swing. Sabyasachi Mukherjee recently took to Instagram to display a look that Isha donned from his label for her Graha Shanti pooja and boy, does she look stunning! Isha donned an outfit from Sabyasachi's India Revival project. The stunning red ensemble was a custom hand-painted and hand-embroidered one with a tilla-work lehenga and an antique bandhej dupatta. Her look was accessorised with a necklace and earrings set featuring uncut Syndicate diamonds and Zambian emeralds from Sabyasachi Heritage. Sabyasachi seems to have become a favourite with brides nowadays and everyone seems to want to be a #SabyasachiBride. Billionaire industrialist, Mukesh Ambani's daughter Isha Ambani got engaged to Anand Piramal in September this year in a grand celebration at Lake Como in Italy and we await the wedding with much excitement! 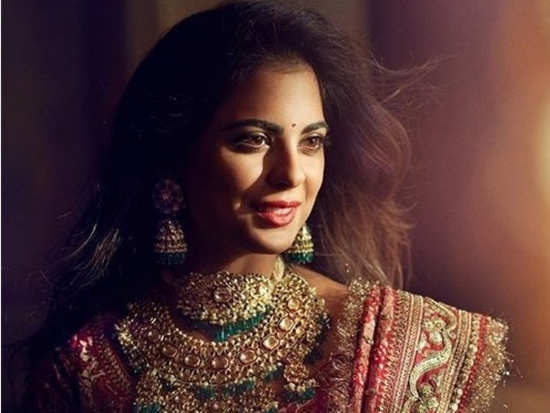 1Isha Ambani is the quintessential Sabyasachi bride! 3Alia Bhatt’s dress is the date-night look you were searching all over for! 4Who wore the Sabyasachi ensemble better: Deepika Padukone or Kangana Ranaut? 5Anushka Sharma’s metallic silver pants are party-perfect! 6Deepika Padukone and Ranveer Singh yet again give us colour-coordinated airport looks to love! 7Deepika Padukone and Ranveer Singh look like royalty all decked up for their Bengaluru wedding reception!